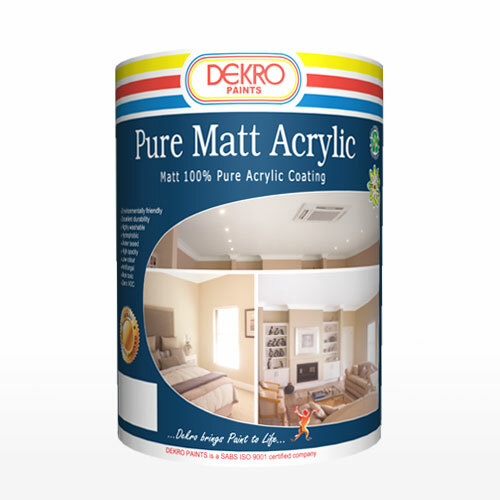 Dekro Super Acrylic is a high quality, washable, matt pure acrylic which dries to a smooth matt finish. 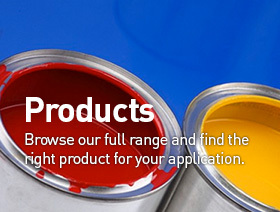 Regarded as the most popular grade of emulsion paint. Regarded as the most popular grade of emulsion paint. 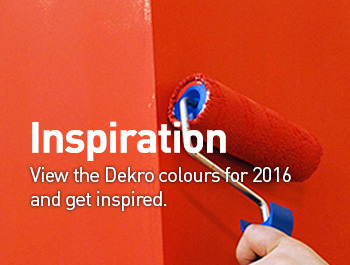 Dekro Super Acrylic is a pure acrylic recommended for internal/external surfaces. 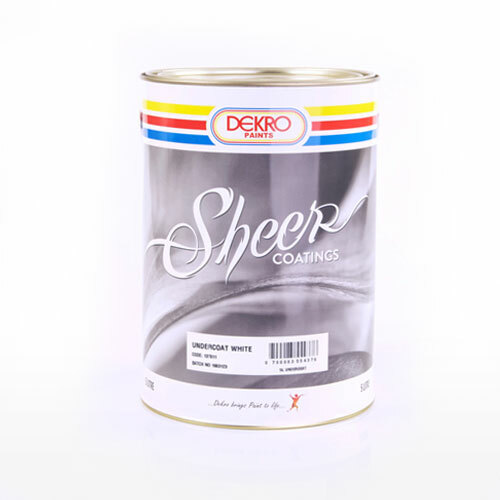 Dekro Super Acrylic may also be applied to metal and wooden surfaces, provided these surfaces have been primed with an appropriate primer. Previously painted oil or enamel surfaces must be thoroughly cleaned and sand-papered before applying Universal Undercoat followed by Dekro Super Acrylic Emulsion paint. New Surfaces: Brick, Plaster, Asbestos, Cement, standard plaster/ concrete surfaces. Remove dust, dirt and plaster splashes. Cut out large cracks and imperfections. Fill with a suitable filler and sand smooth when dry. Apply one coat of Dekrolite Masonry Primer for interior applications. 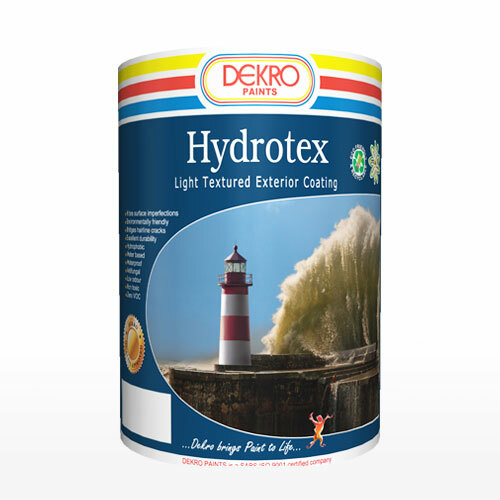 Apply one coat of Dekro Clearseal Bonding Liquid to smooth, brick plaster and Cretestone Areas as well as Plaster polished trowel applied surfaces. 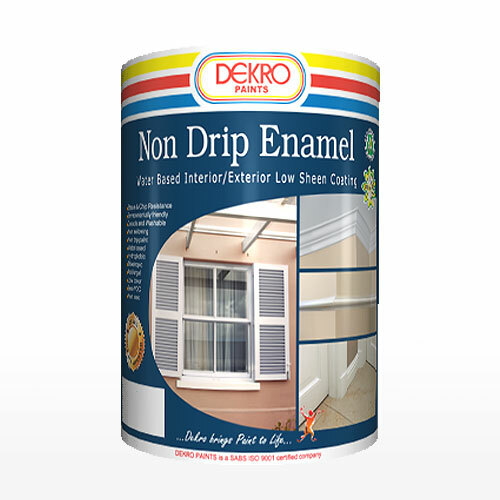 A high quality, washable, matt emulsion paint for interior and exterior use. For best results on exterior surfaces of plaster, concrete brickwork an appropriate primer should be used. 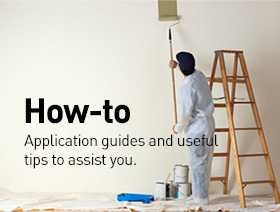 May also be applied to metal and wooden surfaces, provided these surfaces have been primed with an appropriate primer. Previously painted oil or enamel surfaces must be thoroughly cleaned and sand-papered before applying Universal Undercoat followed by Super Acrylic Interior/Exterior Emulsion paint. Do not apply direct to new galvanized iron, sand-blasted steel or aluminium. Application to areas where temperature exceeds 60°C or below 4°C –is not recommended. (Asbestos heating elements). 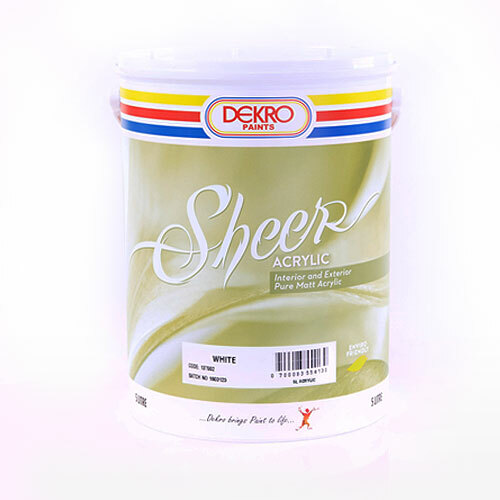 Do not use Mineral Turpentine, Lacquer Thinner or Meths for diluting as this will alter or destroy the quality and performance of Dekro Super Acrylic Interior/Exterior. Do not apply to any plastic-type surface without recommended pre-treatment. Do not apply to surfaces that are mould or fungus infested without recommended pre-treatment. Unsuitable as Asbestos Roof Paint. Type – 100% Pure Acrylic. Spreading rate – +/- 8m. (to obtain a continuous film without full coverage). Colour range – White, range of standard colours as per current colour card. 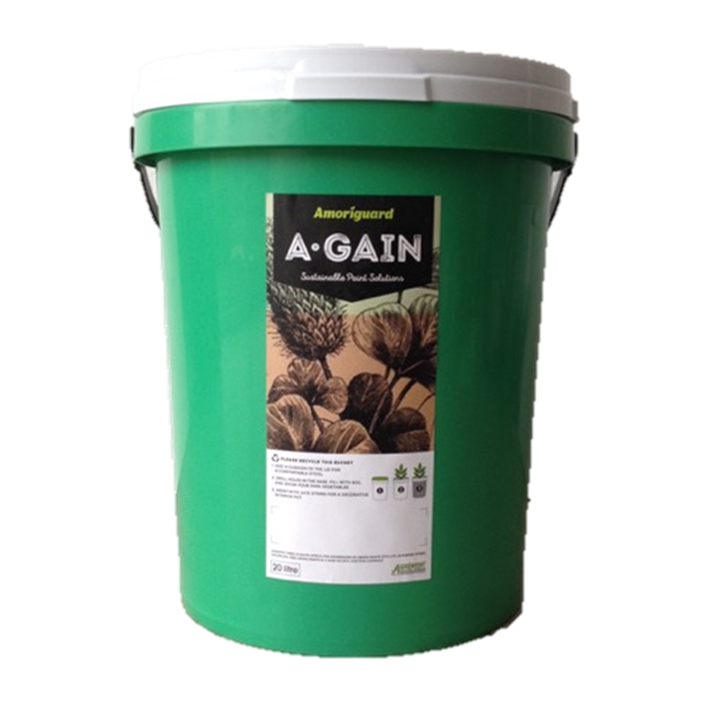 Packing size – 1 litre, 5 litre and 20 litre.